More to the point: Should your business celebrate this holiday? I wish I had a better response for you. Just because other marketers are promoting a holiday, doesn’t mean your business should. Instead, answer these 3 questions to ensure the holiday contributes to your business. Because you still need to convince your boss your decision was correct. 1. Is the holiday aligned with your business mission and brand? Do you sell products associated with the holiday? For example, a Mexican restaurant should create a premium price menu for Cinco de Mayo. Does your company have a history of celebrating this holiday? For example, Macy’s, a department store, is known for the Thanksgiving Day Parade. 2. 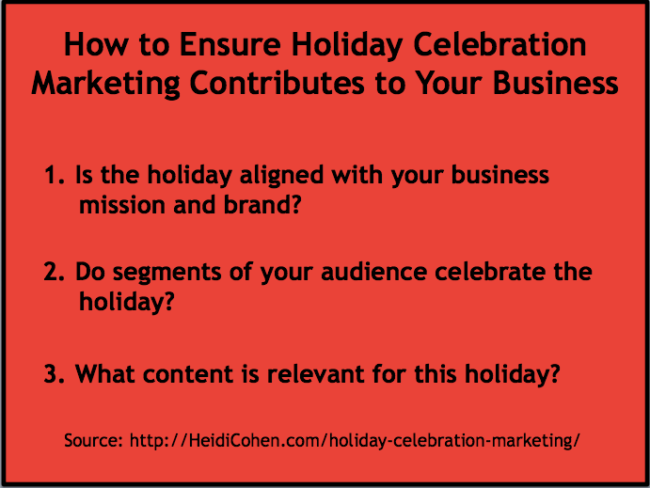 Do segments of your audience celebrate the holiday? Assess your customers, employees and promoters. Also, consider local events. Why is the holiday important to your audience? This can sway your marketing decision. For example, a very personal or religious holiday makes you appear sound deaf. Can you segment and tailor your marketing to those interested in this holiday? Include product, promotions, content, search and social media. 3. What content is relevant for this holiday? While holiday related content, communications and promotions are time sensitive re-promote or update this content annually. Do you have content and communications that can be reused for this holiday? Think evergreen and reused content. Have you assessed how you will support your holiday content? Incorporate website, communication, social media and search promotions. 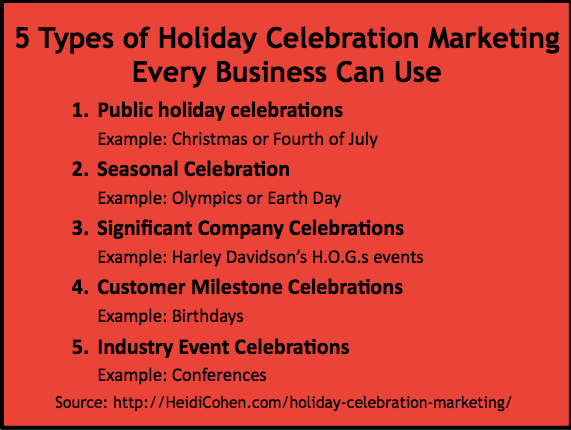 When creating your annual promotional plan, integrate these 5 types of holiday celebration marketing. Include celebrations and events important to your business and location. Skip irrelevant holidays or ones with no affiliation with your business. When I headed marketing for the online division of The Economist, my boss suggested a Valentine’s Day subscription promotion. While our brand color was Valentine red, the romantic holiday wasn’t aligned with the business and political interests of our readers. Even worse, a gift of an online Economist subscription didn’t bode well for one’s romantic future! 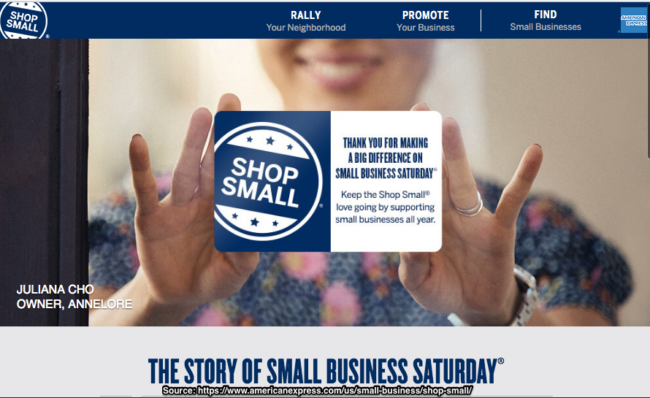 To help its small business members, Amex OPEN created Small Business Saturday to promote these businesses the day after Black Friday. Include your business’s key revenue generating public holidays. This varies by business. For example, candy companies make most of their money during Christmas, Easter, Valentine’s Day and Halloween. Add relevant public holidays. Focus on the events your audience and local neighbors participate in. Tap into the power of charity giving where appropriate. Millennials like to support companies that give back to society. (Here’s the millennial shopping data.) Thanksgiving is good time to use this type of promotion. Occur the same time each year but specific dates vary. Depending on your firm and products, seasonal events can include Earth Day, Breast Cancer Awareness Month or Black History Month. Also schedule one-time events such as special movie openings. When I was at Bertelsmann, I promoted licensed product to coincide with Star Wars and Star Trek movie openings. Science Fiction readers were loyal fans of these franchises. As a knitter, I regularly attend the Maryland Sheep and Wool Festival (May) and the New York Sheep and Wool Festival (October). For many yarn and fleece vendors these events generate lots of sales. Ravelry, an active knitting and crocheting social media platform, often uses these festivals to meet with their members. Brainstorm the seasonal hooks that work for your business. If you have trouble try Googling “holidays“. Take a page from late night talk show hosts to create seasonal holiday content. For the Colbert Report, Stephen Colbert tapped into the power of the Winter Olympics to create content, raise money for the US Skating team and drive revenues for Comedy Central. Include dates important for your business. Often this means the anniversary of when your business started. Incorporate your annual meeting and other company events. 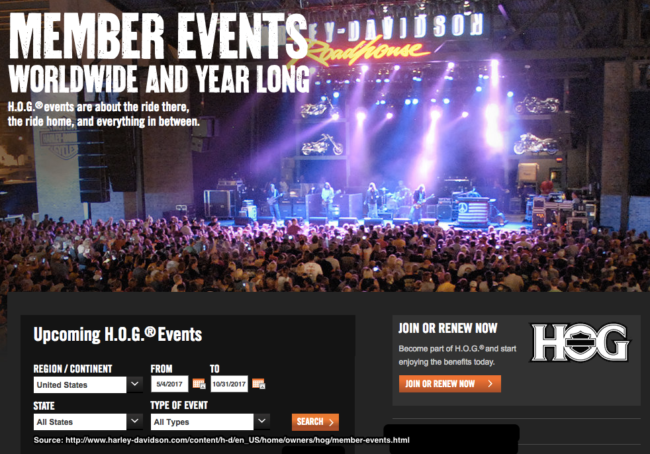 Harley Davidson is known for their member events. Harley owners groups (aka: H.O.G.s) enjoy riding their bikes together. Employees have to qualify to join one of these rides. 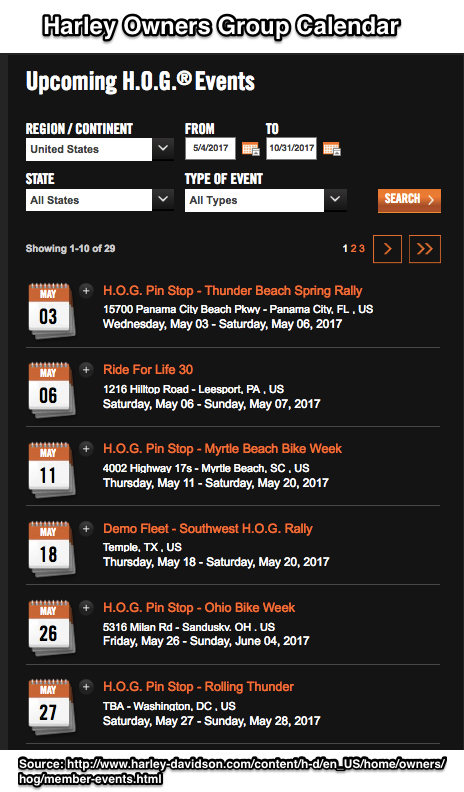 Unlike many other companies, Harley Davidson has a full calendar of events. Move your business anniversary to a low promotion period. Celebrate company-related promotions when people aren’t buying from you. A client of mine did this to increase sales during an otherwise non-promotional month. Focus on your customers’ life events often birthdays or shopping anniversaries. But don’t overlook personal milestones like marriages, babies, new homes, starting (or graduating from) school, and/or new jobs. Get creative! Many clothing and cosmetics stores offer shoppers a special discount either on their birthday or the month of their birthday. It’s a great hook to get customers to share their email address with you. Get customer birthday information. Be discreet especially if your customers are women. You only need the month and day. Append this information to existing customer data or keep it in a spreadsheet. Celebrate your prospects. Offer them a small gift for shopping with you. This works well for wedding and baby registries. Revolve around industry events and conferences. 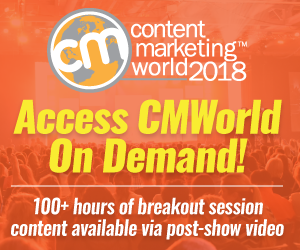 Live events and conferences are key to building relationships and doing deals, especially industry newbies. RazorSocial’s Ian Cleary started establishing his thought leadership by attending conferences. The Social Media Club of New York used the NY Auto Show to hold a social media event at the Javits Center. 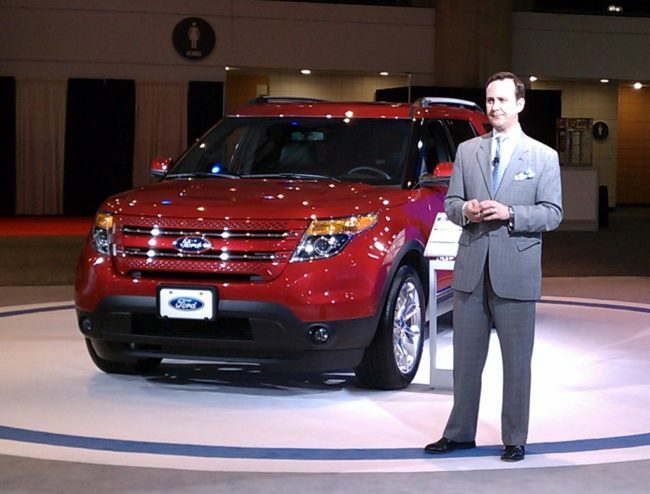 It spotlighted social media expert Scott Monty when he was at Ford. While this example isn’t new, it highlights how to creatively extend your reach. Attend relevant industry conferences and events. At a minimum, know where your industry is headed. Actively participate in conferences (where possible and appropriate). Stand out by speaking, advertising (often called sponsorship), or creating content. Keep track of influencers and their schedules. While you may not be able to afford their speaking rate, they may support your community if they’re in the vicinity. Peter Shankman often gives a shout out when he’s out of town. Use holiday celebration marketing to structure your annual promotional and editorial calendars. Extend these occasions to your content, communications, search, social media and location (online and real life). Make sure the occasions and events you choose are relevant to your business and contribute to increased profitable revenues. At a minimum, holiday promotions provide a creative hook for your marketing including content, social media and promotions. But avoid being heavy-handed or irrelevant. When you observe popular holidays, try to find opportunities to help your business and brand stand out in a relevant way. Where appropriate (and possible) segment your audience to maximize results. Only promote special content to your customers who are interested in these holidays. But don’t let a lack of data hold you back! Tap into your audience’s interests to expand your business and build your relationships in the process. At a minimum, celebrate your customers based on when they started buying from you! Diversify your marketing calendar by testing new holiday options. The best part: You and your customers can have fun with holiday celebration marketing! Photo Credit: Heidi in a Sombrero, Scott Monty at NY Auto Show: © Larry Aronson, all rights reserved. 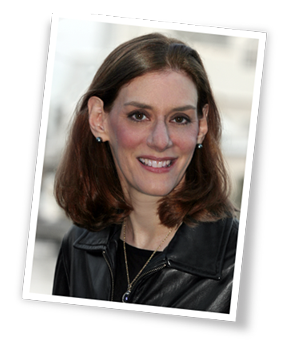 Tags Amex Open, Harley Davidson, Holiday Celebration, Ian Cleary, Peter Shankman, Scott Monty. Bookmark the permalink. 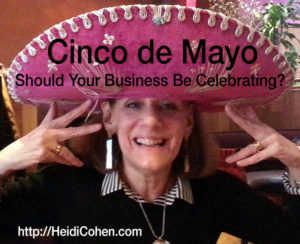 4 Responses to Cinco De Mayo: Should Your Business Be Celebrating? Insightful post. I love the ideas of how business should treat a holiday from the business marketing perspective. Some businesses try to capture all the holiday trends, but don’t know if the holiday and business align together. As a marketer, you need to take advantage of natural hooks to get people to respond to your content and other marketing. To this end, these 5 holiday types are highly useful.